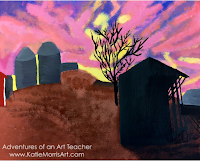 In my first year as PreK-12 art teacher (I previously taught K-6 for 6 years) I tried to do a halfway choice program with my high school classes, which make up the bulk of my program. I kept some parts that I liked and tried some new things. Last year I got a lot closer to what I really want my program to be. 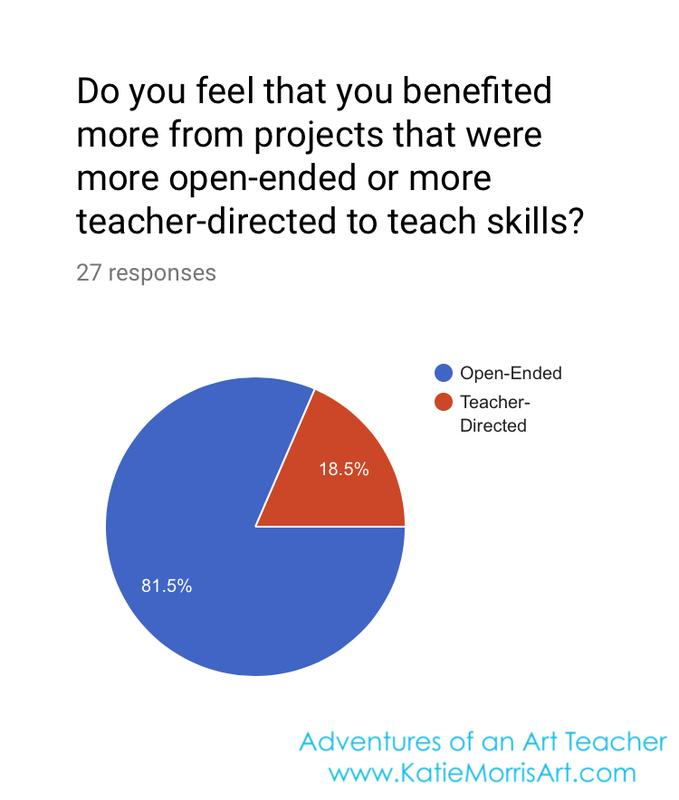 I wanted to tell you how I organized my intro classes and about the feedback my students gave in their end of the year survey. 1. Confidence Builder- I started the year with the drawing boot camp and a more directed project that would be portable (my classes take school pictures and for a week we had to be able to work either in the art room or in another classroom across from the photo studio. We started with animal silhouettes filled with patterns. The students all really enjoyed this and it was a low-risk way to ease into things. There were some pretty cool results, too! 2. Boot Camps- I've used boot camps to introduce students to different media and practice some techniques since I started teaching high school. I made some changes from the first year and will tweak a little bit more for the new school year. 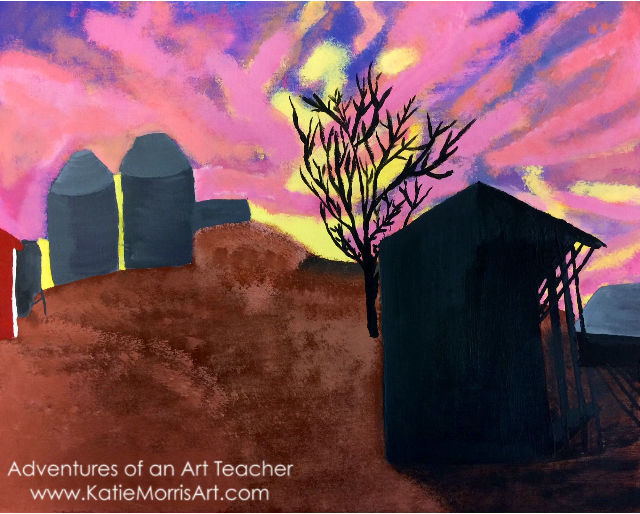 One change was that after the rest of the painting boot camp, I asked each student to paint a landscape. I feel like this also helped to build confidence to give them a little more guidance before they were on their own. This year I'm going to have students practice watercolor a little more. I think that many were still intimidated by watercolor or I just didn't "sell" it enough. I also didn't end up doing printmaking or collage bootcamps last year (instead I just did printmaking demos as kids were interested) but I'm going to add those back in. I still haven't written about the rest of my boot camps from last year but hopefully I'll get to that eventually! 1. 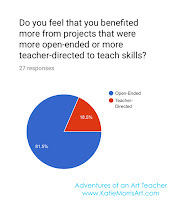 Do you feel that you benefited more from projects that were open-ended or more teacher-directed to teach skills? 81.5% said they benefited more from open-ended projects. 18.5% said teacher-directed. 2. I asked for the students' ideas on themes for next year. Some listed more media based themes, or themes similar to what we did this year (animals, space, etc.) and some had some pretty cool new ideas like "in the dark", "bent reality", "spirals", "shifting nature", or cultural. 3. What was the best part of how the class was structured this year? The students liked the themes and getting to do their own projects, most liked not feeling stressed about deadlines, they liked that they could access the materials they needed, said the boot camps were helpful, said the themes' introductions were quick but thorough, etc. 4. What would you change for next year? Most said nothing. A few said they would like more boot camps to cover more media, some asked for more set options for projects (a few choices for students intimidated by coming up with their own ideas), some asked for more time and some asked for more help managing time. 5. 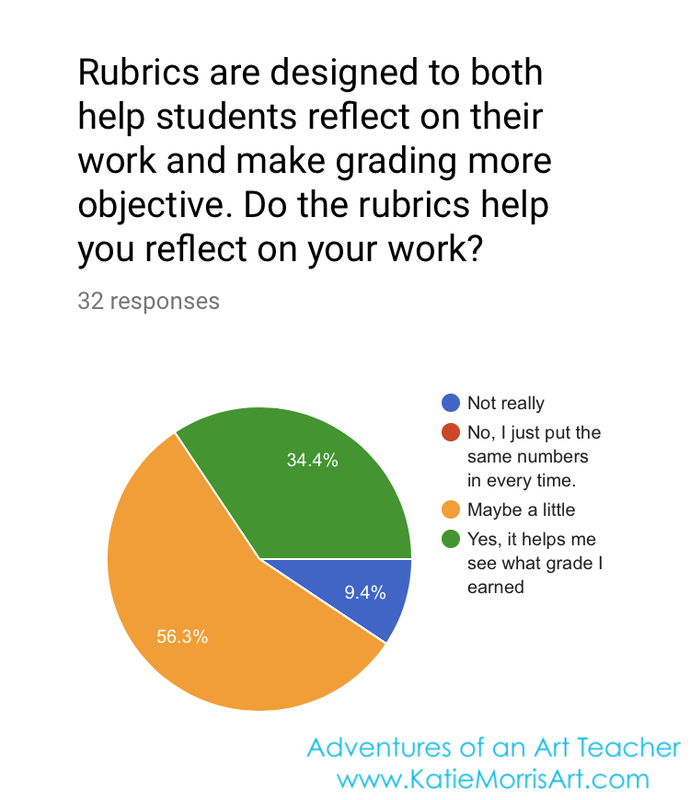 Do the rubrics help you reflect on your work? 6. How would you like to be graded? 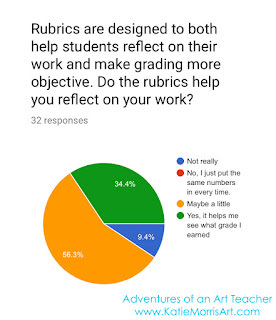 71% said they would like to fill out a rubric and 22.6% said they would rather just be given a grade by the teacher. I realized that my rubrics weren't quite what I wanted. I tried to come up with something that could function for each project and focused on the Studio Habits of Mind but a student could still pass with a half finished project and I just wasn't happy with the system. I got some advice in the High School TAB Facebook group over the summer and completely revamped my rubric and grading system. I will let you know how it works out! 7. Do you feel like the boot camps this year were sufficient? 62.5% said Yes, it was enough to see what the medium could do and how to use them. 15.6% said the boot camps were long enough but they wanted more media. A small percentage said they needed more time to feel comfortable with the media, and most of the rest were not in class for them. I realized I did all my boot camps 1st semester and the students who switched in for 2nd semester students didn't get that experience. 8. Is there anything you hoped we would cover this year but didn't? Most said no, a few others listed things like oil painting, more wheel throwing, or architecture. 9. Anything else you'd like to tell me?